This deep tissue or relaxing massage concentrates on your back and shoulders combined with therapeutic stretching to release stress from the muscles and joints. Helps to release muscular tension relieves back muscle, neck, and headache. This ancient treatment promotes health and balance throughout your body with the simple pressure to all the reflex points on your feet or hands. A Swedish massage with Shiatsu techniques acupressure, energies points, breathing and stretching. Helps to recover the body natural balance increases the well-being sensation. Recommend for Healthy Mothers with more than 16 weeks into pregnancy. Enjoy a mild pressure Swedish massage to relax muscle tension reduce anxiety, improves lymphatic, blood circulation and wellbeing sensation. Our complementary alternative treatment uses a soft tissue massage to promote health and well-being’ for children and adolescents. Deep tissue massage recommended for athletes or people with chronic back pain. We combine Tai tractions, stretching techniques to relieve joints and muscular tension. Restores the body positive energy. Enjoy a deep or relaxing massage with your friend or romantic partner. 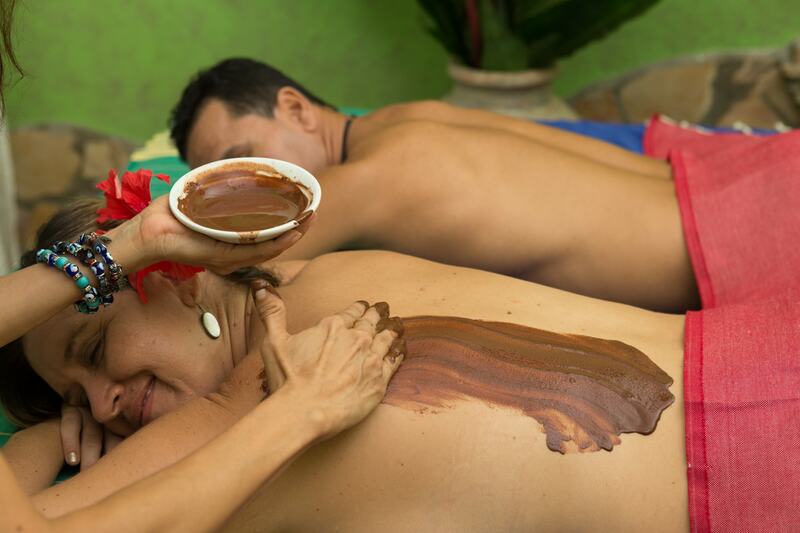 Finish your treatment with an aphrodisiac essence of an organic chocolate body scrub.